If you have a github account, can you open an issue? 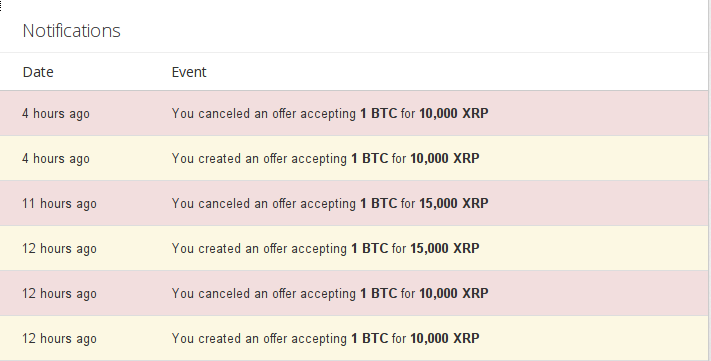 So I got the free bunch of ripples, now I am not sure what do do with it. One question I had, can other people see how much trust you have extended to them? Yes. All trust lines are public because other people can use them. All balances are public because other people can use them. Please give me back some trust. I thought that might be a little much to start with. Unless he is your neighbor. Now that we have basically figured out the concept of trust, and IOU's and in essence one person acting as a bank would act, Can this be made into some sort of newbie tutorial? Because I have heard a few people say essentially: "wow wtf is this ripple stuff, even more confusing than bitcoin" And it doesnt have to be. MtGox provides the really hard part, the navigation of the legally fraught with regulations interface between government fiat currencies and the real value that people really use on the real internet. MtGox is basically a natural inhabitant for the "fiat gateway" niche in the Ripple ecosystem, that apparently has not yet officially taken up residence. I suppose not every financial services company in the world is going to immediately open up a branch in Ripple Country, but as Ripple Country expands more and more might find it a rich enough community to make opening up a branch there make sense to them. Ripple has price discovery itself though, with arbitrage, so eventually it will be Ripple providing price discovery and the "exchanges" we are used to will get to focus more on what they do best, which is getting our virtual wealth out to meatspace for us and our meatspace wealth back into the virtual world for us. s/Ripple/Facebook and you'll see that what you wrote is rampant digital utopianism. Yes, very important points, had to be said, glad someone did, saved the rest of us a whole bunch of keystrokes! Heaven and Hell are both places you can live in, interchangeably, right where you are right now, psychologically. You can go back and forth. That won't change your real situation, you are unlkely to shift between quantum realities with different timelines or whatever the just will it and it will happen crowd are saying in their be a millionaire just by believing you are ebooks (only $99.99, pay now with irreversible new ecurrency!) but the freedom you do have just inside your own mind and feelings about your situation is awesomely massive. But can therefore allow one to be "manic", wonderfully happy, even in some gosh-awful situations. Which can be really good for survival once you are in such situations (you can still live a happy life even after you abandon your facebook account with no way to undo what you already did by giving them information). But can lead you into some gosh-awful situations if used up front, that is, feeling all manic / happy about a situation YOU ARE NOT YET IN! BE CAREFUL WHAT MORE YOU PUT OUT THERE!!! "Don't worry your little head about it [Darling / Joe / Schmuck / Whoever], we [men / rich fat cat bankers / technocrats] take care of all that confusing stuff, you just be a good [whatever] and go [do the dishes / mow the lawn / watch your baseball game / work 40 hours a week for forty years / mind your own business]." I second this. My suspicion is that ones own orders don't show up in the book. tried to place an order in "advanced" -> "trade"
failed saying something about "invalid previous tx"